DESCRIPTION -- As used on board tea spoon from the Orient Line shipping company which is in a very good condition and shows on it the company emblem (click on the picture to see a closer view of the item). HISTORY -- The Orient Steam Navigation Company, also known as the Orient Line, was a British shipping company with roots going back to the late 18th century. From the early 20th century onwards an association began with P&O which became 51% shareholder in 1919 and culminated in the Orient Line being totally absorbed into that company in 1966. DESCRIPTION -- Fantastic souvenir item from the Orient Line, which is a double set of playing cards in original box and all in an excellent condition. DESCRIPTION -- Souvenir ashtray from the original P&O Line vessel the SS Oriana which shows on it the traditional rising sun emblem and is in an excellent condition and dates from the 1960â€™s. HISTORY -- SS Orianawas the last of the Orient Steam Navigation Company's ocean liners. She was built at Vickers-Armstrongs, Barrow-in-Furness, Cumbria, England and launched on 3 November 1959 by Princess Alexandra. Originally resplendent with her owners' traditional corn coloured hull, Oriana appeared as an Orient Line ship until 1966, when that company was fully absorbed into the P&O group. 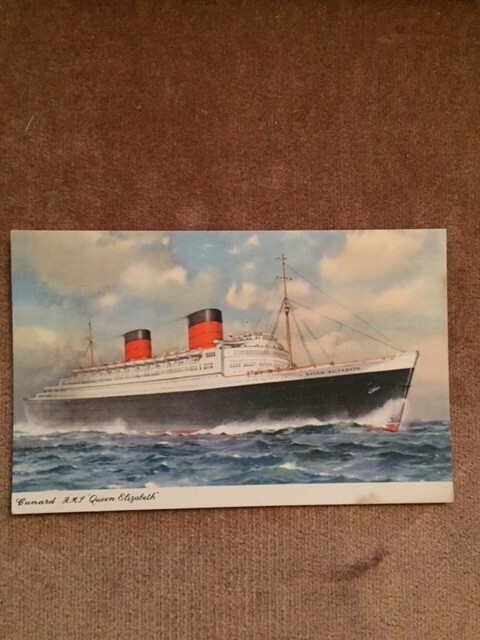 DESCRIPTION -- Superb colour postcard from the famous vessel the RMS Queen Elizabeth and it is in immaculate near mint condition and is just one of our vast stock collection. HISTORY -- RMS Queen Elizabeth was an ocean liner operated by the Cunard Line and was contracted to carry Royal Mail as the second half of a two-ship weekly express service between Southampton and New York City via Cherbourg. At the time of construction in the mid-1930s by John Brown and Company in Clydebank, Scotland, she was known as Hull 552, but she was later named in honour of Queen Elizabeth, Queen Consort at the time of her launch on 27 September 1938, and in 1952 became the Queen Mother. DESCRIPTION -- Sugar Bowl from the Orient Steam Navigation Company produced in the traditional company pattern which is bottom marked showing the company name and logo. It is in an excellent condition with the size being 4Â½" (12cm) and dates from the 1950â€™s (click on the picture to see a close up of the bottom of the item). DESCRIPTION -- From the vessel the SS Orion this is a souvenir glass dish, which is a smoked colour design and shows on it a picture of the vessel and the name. The size is 4Â½"(11cm) x 3Â½" (8cm) and it is in a very good condition. HISTORY -- RMS Orion was probably the most famous of the Australian immigrant ships, and in her earlier life was known as the RMS Orion (Royal Mail Steamship). Originally built for the Orient Line and later owned by P&O, she was designed specifically for the immigration service and was the first British ocean liner to feature air-conditioned public rooms. She was also the first ship owned by P&O, to feature the corn coloured livery. DESCRIPTION -- Original souvenir lapel pin from the original vessel the Oriana from the Orient Line, which is in a very good condition and dates from the 1960â€™s/1970â€™s. DESCRIPTION -- From the Orient Line vessel the SS Orcades this is an early souvenir glass dish with the size being 5"(13cm) x4"(10cm). It shows the name on the front and a picture of the vessel. It is an as new item and dates from the 1960's. DESCRIPTION -- Original as used on board large sized china dinner plate from the Orient Line shipping company which is produced in the traditional ÃƒÂ¢Ã¢â€šÂ¬Ã‹Å“compass' design pattern to its edge and is bottom marked with the company name. The size of the dinner side plate is 9Â½" (24.5cm) and is in an excellent condition and this design dinner service is very collectable (click on the picture for a closer view). HISTORY -- The Orient Steam Navigation Company, also known as the Orient Line, was a British shipping company with roots going back to the late 18th century. From the early 20th century onwards an association began with P&O that eventually culminated in the Orient Line being totally absorbed into that company in the 1960s. DESCRIPTION -- Ever so rare to find original as sold on board small souvenir jug from the SS Oriana of the Orient Line shipping company. Rare very early souvenir which is 2Ãƒâ€šÃ‚Â½" (6cm) high and in a fantastic condition and shows the name on side. HISTORY -- SS Oriana was the last of the Orient Steam Navigation Company's ocean liners. She was built at Vickers-Armstrongs, Barrow-in-Furness, Cumbria, England and launched on 3 November 1959 by Princess Alexandra. Originally resplendent with her owners' traditional corn coloured hull, SS Oriana appeared as an Orient Line ship until 1966, when that company was fully absorbed into the P&O group.